When you stay at Ondas Do Mar Beach Resort in Calangute, you'll be near the beach and convenient to Calangute Beach and Candolim Beach. 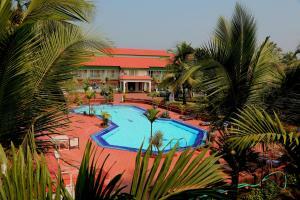 This hotel is within close proximity of Baga Beach and Sinquerim Beach. Make yourself at home in one of the 30 air-conditioned rooms featuring refrigerators and minibars. Rooms have private balconies. Cable television is provided for your entertainment. Bathrooms have showers and complimentary toiletries. Satisfy your appetite at Chef-e-tte, one of the hotel's 2 restaurants. Quench your thirst with your favorite drink at the poolside bar. Buffet breakfasts are available daily from 8 AM to 10 AM for a fee. Featured amenities include limo/town car service, dry cleaning/laundry services, and laundry facilities. For a surcharge, guests may use a roundtrip airport shuttle (available on request) and a train station pick-up service. When would you like to stay at Ondas Do Mar Beach Resort ? Airport shuttle service is available on request. Contact the property in advance to get details. To register at this property, guests who are Indian citizens must provide a valid photo identity card issued by the Government of India; guests who are foreign nationals must present a valid passport and visa. Taxes are subject to change based on Goods and Services Tax (GST) implementation. For more details, please contact the property using the information on the reservation confirmation received after booking. Each day we'll check prices and send you an email for your selected dates at Ondas Do Mar Beach Resort. If you don't have specific dates but would like to check prices for say next weekend or say next month we can check the price too. Click to write a review and share your experience of Ondas Do Mar Beach Resort with other travellers.